Quality, comfort and a cool design are for Fresh Goggles the most important values in the design. We receive advice from the athletes of the Fresh Team to create an optimal experience while using the goggle in the snow. By testing the goggle, these skiers and snowboarders contribute to the development of the latest features. On this page you will find everything about the technical characteristics of the ‘Fresh Classic’- designed for an optimal snow experience. The frame is matte black with a blocky, tough frame. The clear blue mirror lens is the striking eyecatcher of the goggle. The strap is finished with the brand name and the logo can be found on the frame. The Fresh Classic is made up of an orange inner lens and blue full outer lens. 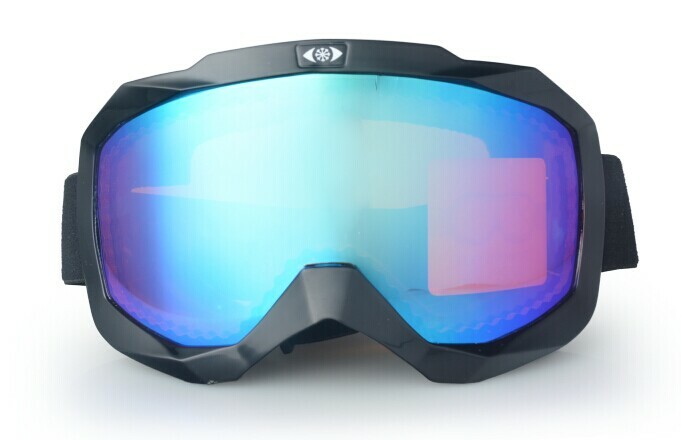 The two lenses create the possibility to regulate the light with the goggle, and thus users will have clear sight in various weather conditions. The UV 400 protection in the outer lens protects the eyes from harmful UV radiation. The inner lens is modified with a 100% anti-fog coating to guarantee a clear view. The anti-scratch coating protects the lens against resistance. The TPU frame of the ‘Fresh Classic’ is hard and flexible. The TPU material is strong and provides protection, while it ensures at the same time that the goggle perfectly fits the face, and connects perfectly with the helmet.The triple- layer face foam on the inside of the frame make the glasses a comfortable fit. Wearing glasses beneath the goggle is also possible. The strap is adjustable and fitted with silicone grip on the inside so the goggle cannot slide off the helmet. The goggle package includes a hardcase in which you can safely carry the glasses with you. The pouch serves to protect and can also be used to clean the lens with. ©2018 Fresh Goggles · All rights reserved.